After the bitter cold of winter and rainy days of spring, summer is a much welcome time of the year. It brings sun, warmth, long days, afternoons by the pool, and usually vacations. Of course, thanks to the constant heat of summer, it’s also the season where we’re most exposed. Between shorts, tank tops, bathing suits, and sandals, all that we once covered up during our months of sweaters, is now on full display. For many of us, that means doing everything in our power to primp and prepare our skin, hair, and nails for out vacation in Casa Del Mar. We tan, get highlights, manicures and pedicures, and often change up our makeup to achieve that perfect summer look. Unfortunately, all those beauty services don’t come cheap. 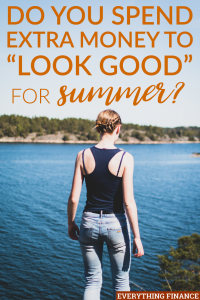 That being said, we don’t always have to pay for high-end treatments and services to get what we need; instead of paying extra for your summer beauty, use these tips to save and look good for summer. I know the idea of going to a student for your hair or nails can make you a little hesitant. However, every stylist started out as a student, and just because they’re still learning doesn’t mean they’re going to do a bad job. Beauty schools often offer low prices for many of their services when performed by students. And fear not, those services are often done under the instructor’s supervision. Another great option is going to a junior or new stylist at a salon, as they’ll also generally offer lower rates until they build a solid client list. When it comes to beauty, there’s not much you can’t do by yourself. Instead of spending hundreds on a tanning membership or countless spray tans, opt to use one of the countless at home products and tanning systems available. They often work just as well if not better and won’t have you rushing back to the salon for touch-ups. The same goes for your nails. With a few, simple products, especially with the invention of the at-home gel system, you can give yourself an at-home manicure that’ll last and look just as good as a salon job. Furthermore, if your hair care needs aren’t particularly difficult, it may also be worth trying a DIY hair dye product as well. Whether you’re searching for a designer or brand name product, or even a more inexpensive brand, there’s a high probability that you’ll be able to find it for cheaper online. Sites like Amazon have a wealth of products available and often times at a much cheaper price. So before you purchase a product at a department store or beauty store, it might be worth it to browse around beforehand. Sites or apps like Groupon often have daily deals and coupons for a variety of events, experiences, and services, which includes beauty. Search around for discounts on everything from spa services to manicures and pedicures. Moreover, be sure to ask around at various salons or spas to see if they offer any deals. Some places will provide package deals when combining services for a lower cost or offer first-time clients deals for trying out their salon. It never hurts to ask and you might be surprised at the discount you could receive for doing so. When it comes to various beauty products, every product tends to have a different effect or look depending on the person using it. In some cases, this is a good thing, in others, it can be extremely frustrating. After all, nothing’s worse than spending money on a product only to find out you don’t like it. Before officially committing to a product, or if it’s something you’re only going to use for a small amount of time, you might want to consider purchasing sample or travel-sized products. Many stores like Sephora, Ulta, or department store counters, offer an unlimited number of samples. By using a sample or travel-size you have the ability to test things out before spending your money, ergo potentially saving you from purchasing multiple, expensive beauty products. When it comes to beauty there are certain items worth the money and others that aren’t. As pretty as the packaging might be sometimes, you don’t really need $30 mascara or O.P.I nail polish. At the end of the day, certain products, designer or drug-store brand, are going to be exactly the same, the only difference is that you’ll pay for the name. Moreover, certain summer products like bronzer or water-proof mascara, are items you only use during the summer and ones that you might not even use up completely. That being said, you and your budget will be better off if you choose to purchase those inexpensively. Save your splurges for the essential items you use every day, year-round. A trip to the spa is always a fun experience, of course, it’s an expensive one as well. Instead of going to a salon to get your nails done or get a facial or face mask, opt to gather friends together for a spa day instead. Set up an in-home spa at someone’s house and take turns doing each other’s nails or facials. That way, you get the experience of being pampered at a fraction of the price. Not to mention the fact that the best part of going to the spa is being with your friends anyway! It’s only natural that everyone wants to look their best come summer. Everyone wants sun-kissed skin and well-manicured nails. But, that doesn’t necessarily mean that you have to pay hundreds to do so. Instead of spending extra money on professional services, use these tips and tricks to get your summer beauty look and stay within your budget. What are some of your summer beauty routines? How do you save money and look good for summer?